During the springtime, it’s common to see bees buzzing about as they pollinate plants and flowers all throughout Miami. 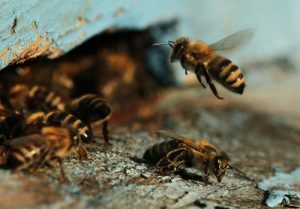 While a crucial part of the ecosystem, bees can become an issue if they are living in large numbers on your property. Bees generally won’t act aggressively towards humans unless they feel that their hive or queen is in danger, in which case they may sting. For this reason, it is important to have bees or bee hives professionally removed if you discover them on your property. Bee stings normally cause nothing more than pain and irritated skin at the affected area, but if you or a loved one are allergic to bees, a single sting can be life-threatening. What’s more, if you inadvertently come too close to a hive, bees can swarm you in an attempt to protect your home, stinging you repeatedly. Bee stings in large numbers can be poisonous, even if you aren’t allergic. Bees tend to build their nests in secluded areas, so you can expect to find them high up in trees, out of the way. If trees aren’t available though, bees have been known to construct hives under homes, on porches, and even underneath gutters. To help keep you safe from painful and potentially dangerous stings, any bee hives on your property should be removed and relocated by a professional. The expert technicians at Critter Control® of Miami have the tools and knowledge necessary to safely relocate bees and their hives while keeping you and the critters protected from harm. For any questions about our bee removal services, or to book a consultation, call us today at 305-258-3587.